I'm going to begin this post the way I finished the last one. We have set up a new website for the continuation of the work begun during the Project Soane competition. Please take a look, and seriously consider the validity of using BIM tools and processes outside the normal "commercial" or "day-job" context. Another weekend has flown by and I didn't achieve half the things I wanted to, but I did at least begin to prepare for the BiLT Europe conference in Aarhus at the beginning of October. I'm doing a presentation on creative use of the "Planting" category in Revit. This will cover both actual trees or shrubs, and other types of object that don't really belong to that category but can make use of the peculiar capabilities of double-nested planting objects. For example, these are railings. You might notice that the second one from the top is a double-sized version of the ones immediately above and below it. This is achieved by nesting a planting category family within the baluster component. These are not intended to be actual railings either. They are inspired by Project Soane and represent the carved decoration on masonry friezes. Railings are very useful for quickly creating these kinds of repeating motifs of course they go around curved corners quite nicely. Here's a couple of images of the kind of thing we are talking about. I've also been reviewing my "lollipop" tree family, cleaning it up and making the parameters a bit more user-friendly. It's intended for use in large-scale contexts: Urban Design studies and the like where you want to keep things fairly abstract but just represent the idea of a row of trees or a small public park. These are all types within a single family, so it's super lightweight. I also added a choice of plan symbols that you can choose from, and set these up to scale correctly to give a realistic impression of the canopy diameter. That's one of the well-known issues with the out-of-the-box planting families. The plan symbols don't adjust properly so a tall-thin tree will have a symbol that's too large, and a short fat one with look too small in plan. I came up with a solution for that a few years ago and shared the family, which has been one of my most popular downloads. But at the time I only did the deciduous RPC tree family. What I've been preparing for October is to cover all of the free RPC content, and to show people who attend my session how to easily adapt the family to incorporate any RPC content you might have acquired from Archvision. I spent a bit of time revisiting my collection of plan symbols. This goes back more than 20 years, to a library of CAD blocks I built up when I was in Zimbabwe. That brought back some memories. Days when my children were still at school. I guess I started using CAD before the youngest even started primary school. And now I have a grandson about to start school in England. For those of you out there who also have kids: cherish those days when they are getting on your nerves, it will all seem magical looking back 20 years from now. One tip I plan to share involves using family files as a working area to store various bits of content you intend to use when making a whole bunch of families. In this case it's CAD content waiting to be traced over or exploded or whatever then pasted into new families as symbolic lines in the planting category. And finally I have a few tree families that I attempted over the years based on different approaches. For example There are some that look a bit more like the bunch of model lines we used to have show up in shaded views back in the days when Revit used Acurender. There might be times when you want something more like this to show up in a shaded view perhaps. The abstract/stylised thing again. And that's it for another short, long weekend. Day job beckons in the morning. Hope to see some of you in Aarhus a few weeks from now. There's always been a bit of an anti-competitive streak in my make up. As a young boy I always dressed up as a "red indian" rather than a cowboy. I also refused to eat meat ... just didn't like the taste and texture, still don't. Maybe I'm just a bit of a wimp. But at school there was always the end of term thing where all the results got totted up, and there would be half a dozen of us vying for the "top of the class" spot. We would be keeping track of the scores as they came out and working out how we were doing, kind of like a league table thing. But I did lose interest in the academic success thing towards the end of school and then at university turned into a positive rebel, and some kind of drop-out. Anyway, it's six years since I started this blog, and for much of that time I have been excited by the steadily climbing numbers and the contact with people all around the world that ensued. Well it so happens that since the last time I looked Google is reporting 1 million page views for my blog, which is kind of nice but not exactly earth-shattering. At the same time the numbers of hits have dropped off a bit over the past year and to be honest, my hunger for keeping the posts going has dropped a little, partly because the whole Project Soane thing has absorbed a lot of my energy. It's not always easy to take the time off to convert the modelling work into an interesting post, and there's so much still to do on the models. Looking at my stats, There is a dramatic peak about a year ago. Don't really understand that. Tend to think it must be an artefact of the way the stats are calculated by some algorithm or other. But it's clear that they have dwindled back to their former level now. I think that can be linked to not posting regularly enough. But then, "does it really matter?" Maybe this blog isn't going to be my main focus going forward, who knows. Maybe it can just tick over with a couple of posts every month and a more or less static following. Looking at stats for the past month, they definitely show a spike straight after my last post. So my frustration at not finishing off posts to keep stoking the fire seems justified. But when you look at the posts that actually get hits, that post is half-way down the list. All the rest are 4 or 5 years old. Looks a bit like the law of diminishing returns. While I'm reviewing my analytics, what about the comments? Well people do sometimes say nice things, which is great. And people ask for help, which I'm usually very slow in responding to. And I still get spam on a fairly regular basis, presumably from very clever robots, or maybe human-assisted robots of some kind. But that's seven comments in the past two months. Which is fine, because I really don't have it in me to spend a couple of hours a week dealing with my comments stream. So probably we are looking at a blog that ticks over for however many years I want to keep it going. I know that from time to time someone discovers my blog and gets very excited working through my past posts. I know quite a few people have this mental note in their brains to find the time to read back through my blog more thoroughly, cos they keep finding little gems. I go back over it myself from time to time, and I am really proud of what I've produced over the past 6 years, so I do want to keep the blog active and to encourage the idea of open sharing. But rising to new heights? Exponential growth? Making a living out of my BlogSpot persona? maybe not. SO ... what's new? Well I've been working on an idea that crystallised while I was in the UK talking to people from the two museums. 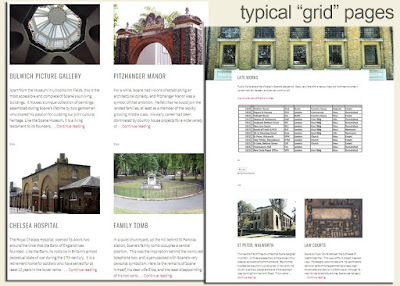 Which is a website focused on Project Soane. The competition websites were temporary, and the A360 space is really targeted at active Revit modellers. Project Soane needs to reach out to the general public, the kind of people who visit the Soane Museum, or the Bank of England Museum, or Dulwich Picture Gallery. We have a lot of stuff now that could be usefully shared on line with the average museum visitor, or someone who might be a walk around looking at old buildings, and buy the occasional book. I chose WordPress this time, just to see how different it is. Well, partly because WordPress sites tend to look a bit sexier, and when I explored, I found templates that were less blog-like. So the basics are up there, and it will continue to grow. I'll be interested to know what people think. There will be some reference to BIM, but not much that is specifically Revit. Lots of images generated from Revit models of course, but the focus will be on sharing ideas about Soane's work and the social context within which it arose. I want to focus less on talking about BIM tools and processes themselves, more on just using them to think about our built heritage. I've enjoyed setting up the website and learning a tiny bit more about formatting pages with HTML. Nothing clever, just following step-by-step instructions to create "grid" pages that show a picture and link through to the next level. I've also had to come up with a naming convention for the images so it will be easier to replace them with newer versions as the models progress. There are two phrases that I have been using for a while now: "the BIM pencil" and "the Way We Build". They both reflect a belief that the history of our buildings and cities is an important research field, a doorway to understanding ourselves. The way we build tells us a lot about who we are. It refers to evolving architectural styles, functional aspects of city form, building techniques and materials. The BIM pencil implies using digital tools for hands-on research into the way we build. So that's what the Project Soane website is all about. Tale a look for yourself.